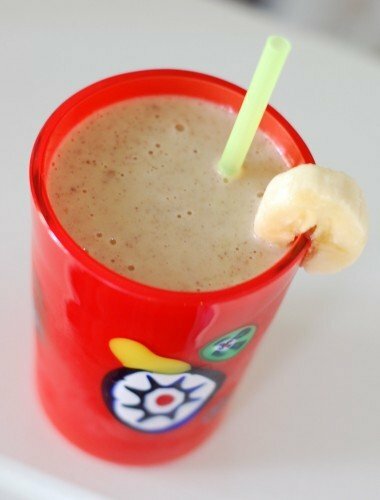 One day I was out of berries and my girls wanted a fruit smoothie so, inspired by a blog reader, we tried a peanut butter banana smoothie instead and…yum! It doesn’t get much easier than this, and we find smoothies to be the perfect supplement to almost any breakfast or lunch. These are also super good frozen too, but more on that later. Combine all ingredients in blender and process until smooth. Enjoy! Recipe variation: If you have frozen bananas on hand you can use those and omit the ice cubes. We melted an unsweetened piece of baker’s chocolate and made a smoothie with milk peanut butter, melted chocolate and a touch of honey. We also added frozen banana chunks. It was OUTSTANDING!. It tasted like a smooth blizzard. Our silicone push-up popsicles molds arrived today! We filled them with a banana/almond butter/half & half smoothie mixture (similar to what you’ve posted today) and are waiting for them to freeze!! The popsicle molds were bigger than I expected, and that was a good thing! Thank you for equipping us for good eating! We add greens, kefir, and raw honey to ours for extra nutrition. You can’t even taste them. I also blogged about other ways we “hide” veggies recently if you want more ideas. What is your thought on adding protein powder to smoothies? I realize that this is not a “real food” but I have debated doing this to make a smoothie more of a “meal” for the kids but keep going back and forth about it. Love all your recipes…thanks! For extra protein try Greek plain yogurt. Tons of protein. We use a recipe similar to this and we add a bit of spinach. It changes the color a bit, so I don’t do it with my pickiest child (better to get some bananas in him that nothing), but you really can’t taste the spinach at all. I’ve been thinking about adding spinach to my smoothies too, but was concerned about the color change. I think I’ll try it and put the smoothies in cups that you can’t see through that have lids/straws. Think this would work? When you say you add spinach, do you mean spinach leaves? Yes, we add fresh spinach leaves to our smoothies sometimes. I use essentially this same recipe but I pack the rest of the blender full of spinach and also add some milk to help it liquify. It turns bright green and tastes so good! I think kids would like it because of the bright color – especially kids that are used to eating fake food that has food coloring in it. Instead of yogurt, I use coconut milk, and add protein powder and a tablespoon of organic cocoa powder. Its delish! I made these with lunch today, and my 3-year-old LOVED them! (I did too!) We are excited to try the other fruit smoothie recipes. I can’t believe how simple your ingredients are compared to what we used to eat. And everything tastes SO MUCH BETTER! Thanks again for sharing. I hope you are working on publishing these recipes and philosophies in a cookbook! i’m assuming you use natural peanut butter and not regular. What brand? I do the same type of smoothie but sometimes add oats in it as well. I use 1-ingredient organic peanut butter that you can grind yourself at stores like Earth Fare and Whole Foods. ummmm..I LOVE THIS! You make eating healthy easy! This is my new breakfast. So I made it twice- I’ve added vanilla and/or honey. YUM! Absolutely delicious. I didn’t have any yogurt so I used 1/2 cup of whole milk that we got straight from the dairy (chemical free and no artificial additives, just pure). It was wonderful and my boys loved it. Our boys are on a gluten free diet to help with their ADHD so I was so happy that they loved this. What kind of changes have you seen in your boys doing a gluten free diet? My son has ADD and I am looking for alternatives to medication to help him. I am reading that changes in diet can help. Thanks! I make a smoothie similar to this for my dd’s. They love it. 1 frozen banana, 1.5 cups chocolate soy milk (dd can’t have dairy), large tablespoon of peanut butter. What do you think of milk being acidic for the body and actually calcium robber. I read this recently where they talk about saving our bones. YUM im going to make this for breakfast tomorrow thanks! Oh my goodness! I have died and gone to heaven! YUM-O! Made these awesome smoothies this morning…my two and a half-year-old said, “Mmmmm…this is sooooo good!” These will certainly be making a regular appearance for breakfast….Thank you!!! What do you think of using Nutella in place of peanut butter? The first ingredient of Nutella is sugar so it is definitely not a good substitute! Based on the ingredients Nutella should be considered a treat or special dessert. Nutella also uses fake vanilla, or vanillin, which is a paper production waste product. Yuck. Delish! For years I have been making smoothies and throwing a handful of nuts (typically almonds but sometimes walnuts) into them as well. You can’t even taste them when it is all done, but it adds some more nutrition. My favorite is 1-2 banana(s), a handful of almonds, and a dash of cinnamon into a blender. Then I fill the blender with milk, just so that the milk is a little bit below the top of the bananas. Then I blend it up and enjoy it. Hi! I found you from Yahoo! awhile ago. I really can’t believe schools and parents are giving their kids sweets and cakes as rewards when, I don’t know, they get an A+ on a test! I thought schools were suppose to be healthy, when on Tuesdays, my school serves for breakfast giant cinnamon rolls made with white flour. I just have to say, my favorite smoothie is milk, peanut butter, flax seed, frozen banana, and vanilla. Delicious! Use sunflower butter instead of peanut butter. Really delicious! I just made a Peanut Butter Banana Smoothies for my son when he got home from school. He said it was AMAZING! Thank you for the delicious healthy recipes! I like to add toasted wheat germ to our smoothies. Is wheat germ allowed? I just tried this with my kiddos and my picky two year old who doens’t particularly like new things just scarfed this down!! Yea!!!! We only used whole milk since we didn’t have plain yogurt on hand but was still delish!! The kids had fun putting ingredients in the blender and watching them come smooth! Thanks for the recipe!! I started making this and my blender got clogged up (putting the peanut butter in first isn’t a good idea, or maybe my blender is just cheap), so my hubby came down and “fixed” it. He added more of everything and it is so amazing. Thank you for a great recipe! Hi there — I just came across your website and am so glad I did. Thank you for all the wonderful ideas! For your smoothies what type of blender do you use. I need to purchase a new one for smoothies and not quite sure where to start. Would love any suggestions you have. Thanks again for being such an inspiration! I actually have a cheap-o blender from Target and while it does the trick (especially if I shake it around while it’s blending LOL) I would love a vitamix one day! Lol…I do a lot of shaking with ours as well! My two and twelve year old and I do the “silly” dance because it takes so long to blend anything with. Thanks!! I am just learning about food. I was recently diagnoised with high BP, High cholesterol, very high tryglicerides and am pre-diabetic. I learned how bad store bought peanut butter is for you. It increases your bad cholesterol(LDL) and lowers your good cholesterol (HDL). Look for the peanut butter with the oil on top (old fashioned) and refrigerate it after opening. Or make your own as Lisa has suggested. Love this site, thanks Lisa! 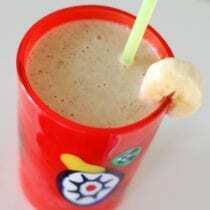 Has anyone tried using soynut butter in smoothies? My son has nut allergies and won’t eat sunbutter. But I would really like to find a smoothie recipe and this looks yum! I’ve been making something like this for years. Only I freeze the bananas instead of adding ice, and I add cinnamon. Cinnamon works really well in that smoothie. I tried this for the first time this morning, and while I loved the flavor, I felt the consistency was too creamy for my taste and didn’t have any of that slushy texture that smoothies typically have. I’m not too kitchen savvy, so I wanted to ask…do you think if I just add more ice that I’d get that texture I’m looking for? Or maybe cut out some of the yogurt? Or both? First of all thank you so much for informing me on what was really going into mine, and my families bodies. I have always tried to eat ‘healthy’ – no artificial flavors/colors, no high fructose corn syrup but I had no idea about GMO’s and many other things I have learned from your posts! And I am happy to say we have changed a lot of our eating habits and will continue too! My question is though…what type of peanut butter do you buy or do you make your own? My family LOVES peanut butter so I am afraid this is a switch they will not go along with. Laura, We recently made the switch from “regular” peanut butter to the one ingredient kind. We just buy the Kroger brand and it only has peanuts and salt listed as ingredients. Our family loves peanut butter and I was worried about changing. We actually like it better! Hello there! Thank you for your wonderful advice. I have some friends who recently have said peanut butter is horrible for you and etc. What are your thoughts on peanut butter? I make something like this all the time – my toddler loves it. We use organic almond or soy milk + banana + peanut butter. Delish! After reading the label of our protein powder, we ditched it immediately. This is a fabulous alternative. I used plain greek yogurt which at first had a “unique” flavor (tangy?) but it grew on me and filled me up! My 1 year old loved it too! Any other protein shake/smoothie recipes? This was wonderful! I used dark chocolate almond milk instead of whole. It turned out to be a chocolate, peanut butter, banana masterpiece!!! Just tried this as an after-school snack. It was a home run. I threw in an avocado (mostly just to use it up before it went bad) and it was deeeelish. It’s also really filling; my kids didn’t immediately complain that they were still hungry like they do after finishing most snacks. I love that I’ll be able to put this in a thermos and bring it along if we need a snack on the go. Simple, quick, portable, yummy AND nutritious. This recipe is a keeper. Thanks again! We put leftover smoothies in the freezer – they keep great but you will have to give them a little time to thaw. The peanut butter sounds great. We toss all sorts of things in smoothies but I haven’t tried peanut butter. Can you clarify the amount of milk? Thanks! I would use the knives for everyday cooking. I’m always new recipes.